Original recipe by Giada De Laurentis, adapted by GKC. Great color, flavor and a zip to this salad. Add grated cheese for a nice dairy version. Dressing: In a small bowl, whisk together the olive oil, lemon juice, garlic and honey until combined. Season with salt and pepper, to taste. 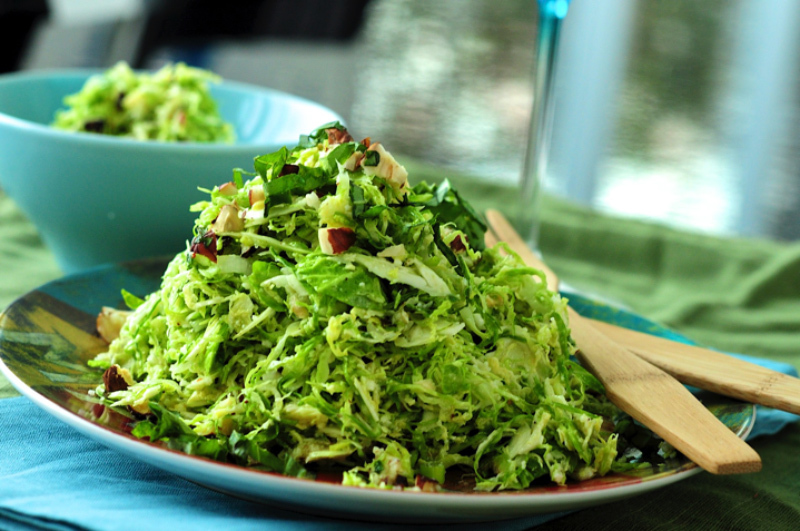 Salad: Slice the brussel sprouts into thin strands. Wash and check thoroughly. Bring a large saucepan of water to a boil over medium-high heat. Add the Brussels sprouts and cook for 1 minute. Drain and put in a bowl of iced water, then transfer to a colander to drain and dry well. Put the Brussels sprouts, arugula, endive, and almonds into a large salad bowl. Add the dressing and toss together. If shredded cabbage is side, is the brief one minute cooking needed? Thanks. You can skip it but dress the salad a bit early to soften the cabbage.